Werewolf legends reach back to the Golden Age of Gaia. Garou still gather around the campfire today, even as tribe fights tribe and the Wyrm slowly devours the world. Now you can relive some of the greatest Werewolf legends with Werewolf Chronicles Volume 1, a compilation of the first Werewolf stories ever told. 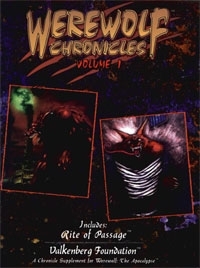 Werewolf Chronicles Volume 1 combines the original Werewolf chronicle supplements Rite of Passage and Valkenburg Foundation under one, all-new cover. These classics have been out of print for years and now can't be found anywhere else. Two classic Werewolf soucebooks: Rite of Passage and Valkenburg Foundation, two of the books that established the world of Werewolf. A complete startling story for a Garou pack, combined with a series of interrelated stories that create a whole Werewolf chronicle. A fully developed hangout for your pack and setting for your game, and a bunch of truly wacked-out Garou. This title was added to our catalog on April 21, 2009.